Meet Mr. Yodong Lee, a timid 27-year-old virgin who spends his days in a dull office job and quiet nights at home with the dog. In one day Yodong's life is turned upside-down when he takes in a poor orphan girl who magically transforms into a vampish vampire. Losing both his virginity and his dog to his new lover's voracious appetites, our protagonist is catapulted into a radical new world of danger and excitement. Faced with an oversexed boss who accuses him of sexual harassment, a sadistic ex-con with a pair of fang marks on his neck, and a lover with a strong aversion... or risk being sucked dry by a vampiric world. 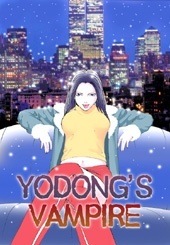 Yodong's Vampire was digitally published in English by Netcomics on January 18, 2006.